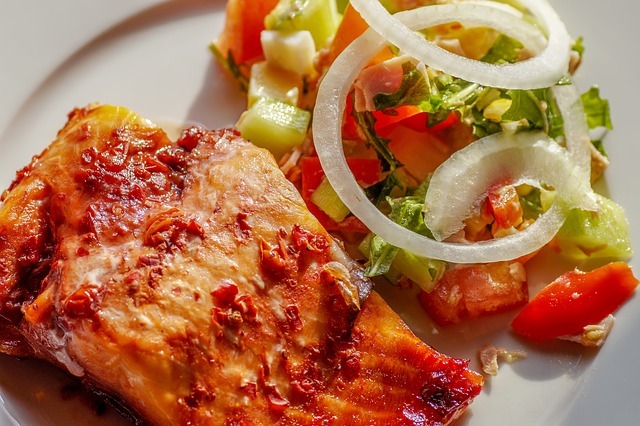 The link between dietary fish and high blood pressure is scientifically confirmed. There is an inverse relationship between dietary fish consumption and high blood pressure. Researchers have observed that communities that live off a rich marine diet have lower incidences of cardiovascular diseases (CVD) and arterial thrombosis. Arterial thrombosis refers to blood clot in the arteries which could be fatal. These findings are similar to what drew scientists to the link between calcium and blood pressure were it was also observed that communities that drank hard water vs soft water suffered less from CVD. The real value and benefit in consuming dietary fish for high blood pressure is derived from the fish oil. This means not every type of fish is beneficial to high blood pressure reduction. The fish consumed must be fatty fish. Studies show that salmon, herring, mackerel, anchovies, and sardines are suitable oily fish which are also widely available. These fish contain n-3 fatty acids which to most people are known as omega-3 fatty acids. The two main omega-3 fats found in fish are EPA (eicosapentaenoic acid) and DHA (docosahexaenoic acid). This is why any material on omega-3 fatty acids mentions EPA and DHA. The benefits derived from omega-3 fatty acids go beyond high blood pressure reduction such as lowering blood fat and helping with depression. However, blood pressure control is essential to preventing a wide range of cardiovascular diseases and complications that follow chronic high blood pressure. In a study that was considered long term, covering a period of 8 months, hypertensive participants were given 3 cans of mackerel per week, both systolic blood pressure and diastolic blood pressure numbers significantly fell by the end of the period of taking the diet. 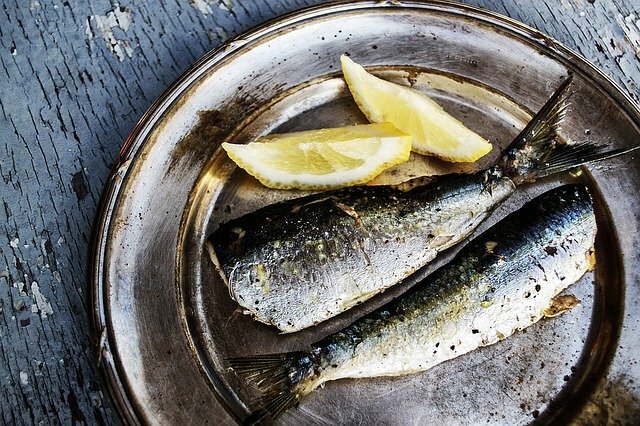 Researchers concluded that even a low dose consumption of oily fish such as mackerel had a positive effect of reducing high blood pressure in the long term. Not only did this study confirm the beneficial link between fish and high blood pressure, it also indicated that processed canned oily fish with the necessary omega-3 fatty acids content is effective in reducing high blood pressure. This is good news for all of us who do not live next to abundant marine life as is the case with communities that have been shown to have benefited from a rich fish oil diet. To back the link between fish and high blood pressure with some statistics, another 1993 study by M C Morris of the Department of Epidemiology, Harvard School of Public Health involving 1356 people established a dose-response effect of fish oil on blood pressure of a systolic blood pressure reduction of -0.66 mm Hg and -0.35 mm Hg for diastolic blood pressure per every gram of omega-3 fatty acids. While these reduction numbers may at first thought seem negligible, researchers have long demonstrated that the slightest fall possible in blood pressure numbers has a significant effect in reducing the risk of cardiovascular disease. In other words, any form of reduction in blood pressure readings is useful and must be welcome. Nevertheless a 2017 study published in the JSciMed Central by M. M. Engler of the Department of Physiological Nursing, University of California, showed that the blood pressure reduction of omega-3 fatty acids is dose and time dependent with blood pressure reductions of as much as 5 mm Hg on systolic blood pressure and 3.5 mm Hg diastolic blood pressure possible. It's also been previously asked what the recommended daily intake of both EPA and DHA is. In the United States, there is no official recommended daily intake of omega-3 fatty acids. This is also in part because these are not essential nutrients. In addition, there is also an apparent general lack of convergence on what exactly the body requires daily in omega-3 fatty acids. Hence, it is common to find varying recommendations of daily omeg-3 fatty acids daily intake across the world. 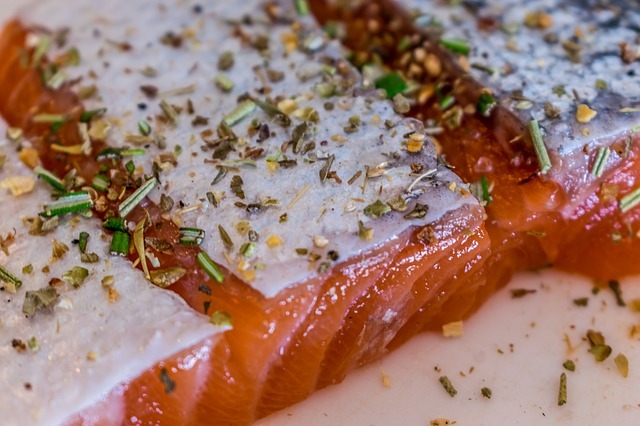 Our findings lead us to recommend about two to three servings of fatty fish per week. This should leave you close to the average recommended EPA/DHA intake across different parts of the world. Researchers often refer to potential agency of fish on high blood pressure. This is because the exact mechanism by which omega-3 fatty acids found in fish effect blood pressure reduction is not fully understood. Studies have considered a multiple number of EPA and DHA induced mechanisms at work to reduce high blood pressure. One such possibility is that fish oil manipulates the endothelium, which is the inner lining of blood vessels. The endothelium plays an important role in blood vessel relaxation and constriction. Omega-3 fatty acids could possible increase the production of nitric oxide, also known as NO, within endothelium cells resulting in vasolidation or dilatation of blood vessels which in turn reduces blood pressure. NO is responsible for vasolidation suggesting that EPA and DHA works through NO to achieve blood pressure drops. Omega-3 fatty acids have therefore been shown to reduce artery stiffness through such a mechanism. One of the studies that we refereed to earlier established that canned fish had benefits on high blood pressure in the individuals involved in the investigation. 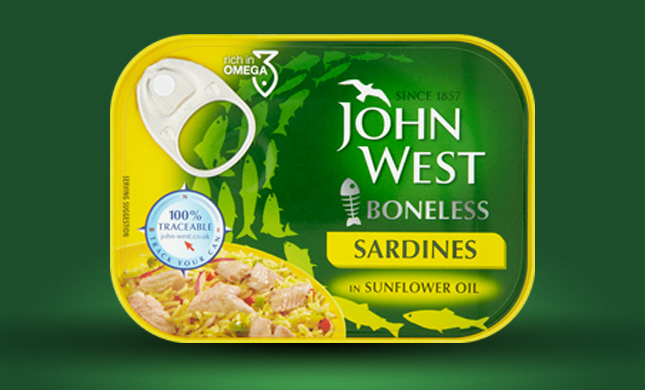 Many canned fish products today are advertised as having cardiovascular benefits due to the accompanying omega-3 fatty acids that they contain. This is generally the case. Some such products are governmental authority approved yet some simply make marketing claims in order to push volumes in the marketplace among increasingly health conscious consumers. The degree to which canned fish contain omega-3s, which is beneficial to blood pressure, will vary from one product to another. The different varieties of tuna, for example, will vary in terms of the levels of omega-3 fatty acids that they bring to the table. Our findings have, however, shown that among the tuna varieties such as skipjack, bluefin and yellowfin, omega-3 fatty acids content will vary by some 2 grams per ounce depended on a variety of other factors such as season and waters. The processing methods of the particular canned fish involved will also matter. Some canned fish is cooked once or twice to better preserve it. This all has confounding effects on the final EPA and DHA output when the can is finally consumed. It is recommended that to maximize on omega-3 fatty acids, water packed canned fish is superior to oil packed canned fish. These are some of the canned fish and high blood pressure considerations to keep in mind. These numbers are per 4-ounce serving of each type of fish in milligrams of EPA/DHA. Takes 30 min to prepare. Serve with some roasted mixed vegetables for a light meal. Get your ingredient s together. Preheat oven to 190 degrees F. Line an oven tray with heavy duty foil paper and lightly grease it with some oil. Break the egg into a bowl. Add milk, beat and set aside. Put flour into a wide, flat plate. Add the soup powder, salt and curry powder. Mix gently until evenly combined. Take set aside beaten egg, dip each fillet into the egg then roll over in the seasoned flour and coat evenly. Shake off any excess coating. Place coated fillet in prepared oven tray. Repeat process until all the fillets are coated. Drizzle a little oil over the coated fish. Bake in preheat oven for 30 min or until golden brown and tender. Keep warm until required and squeeze a bit of fresh lemon juice just before serving for heightened flavour and enjoyment!